At this stage of your academic career you will need to do research. For an individual project or a thesis during your last year of undergraduate study or as part of your Master or postgraduate course. You will need to be able to find, evaluate and use academic literature correctly. So you need to optimize your information literacy skills.This information literacy course will help you with this. This LibGuide builds on from the basic information literacy LibGuide. It contains more in-depth information, and new topics have been added. See the basic Information Literacy LibGuide. After studying the LibGuide you will have acquired the skills needed to locate, access and critically evaluate existing information and data, and to use the information you have found with academic integrity. Information on Pure, Open Access, Research Data, Orcid and more. At the University of Groningen, academic information is provided by the University Library (UL): the University Library City Centre (UL Inner City), and the University Library Zernike (UL Zernike). The UL also works closely with the Central Medical Library of the University Medical Center Groningen. These libraries are the information centre for teaching and research for the whole University of Groningen community. If the University Library does not have the material you need (books or articles) you can request them from another library in the Netherlands through Interlibrary Loan (ILL). The Library can provide workshops for thesis students. If there is a need for this, please contact your teacher. See also Instructions and workshops. 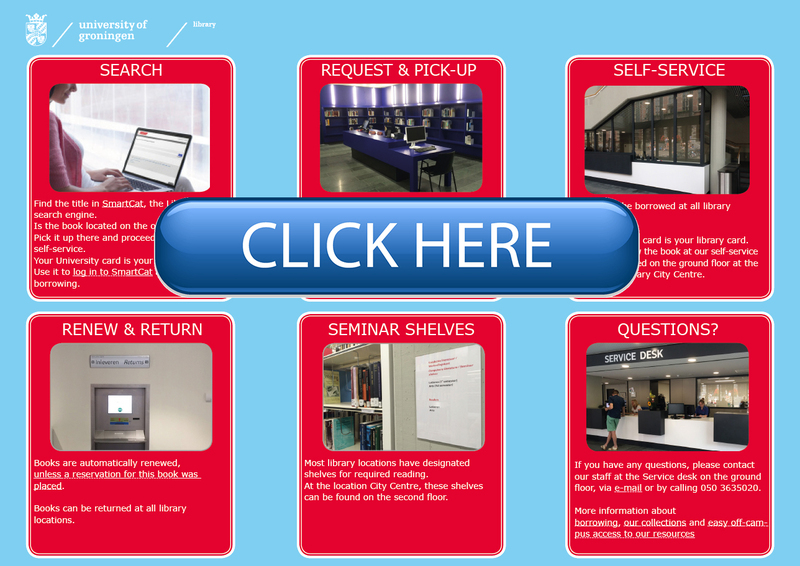 You can also ask questions via Your question on the Library's home page. Your question will be handled by the information specialist of your subject area. The University Library has developed a set of subject guides which list a selection of important literature, by subject. This is a good starting point for your research. Click here to find an overview of all available subject guides. The University Library City Centre has many small lockable studios and a number of group studios UG students can book for short or long-term use. UG students working on a thesis or graduation assignment can book a studio for one month. Depending on availability, an extension is possible. You can book studios through this web form. If you need a title for your research which is not held by the University of Groningen Library, you can put in a request to have the Library buy it. All you have to do is fill in this form. LibGuides of the University Library Groningen may be re-used under this Creative Commons license. Please state: "Based on a University Library Groningen publication on http://libguides.rug.nl/."